All “Rokket” monsters on the field gain 300 ATK/DEF. You can activate 1 of these effects; ● Special Summon up to 2 “Rokket” monsters with different names from your hand in Defense Position. ● If your opponent controls more monsters than you do: Special Summon “Rokket” monsters with different names from your GY in Defense Position, up to the difference. You can only use this effect of “Boot Sector Launch” once per turn. We spared you from using reviewing Mekk-Knight Avram because reviewing Normal Monsters typically doesn’t achieve much, plus we don’t want to check THIS out. Instead we will look at a great Field Spell for Rokkets, Boot Sector Launch. Obligatory Terraforming mention because this is a Field Spell. BSL boosts your Rokkets by 300 ATK and DEF, a nice boost considering the Rokkets typically have good stats already in ATK or DEF. This card has two effects you can chose to use one of per turn. You can Special Summon 2 Rokkets from your hand in DEF Position. You can Special Summon Rokkets from the GY if your opponent controls more monsters than you up to the deficit. 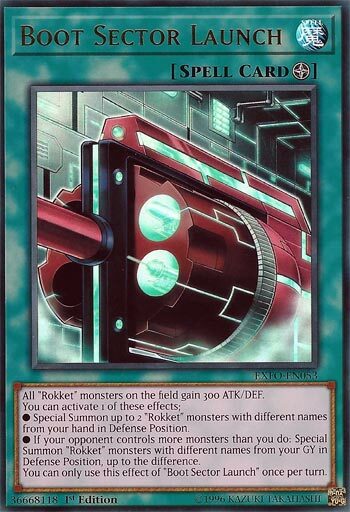 Rokkets are based on getting Link Monsters out so they can target the Rokkets and trigger their effects, so this card is meant to give you Link Fodder. Currently they want to turbo out Borreload Dragon, but we are getting Borrelsword Dragon and Booster Dragon one day to give you more options. I imagine they will print a Borrelguard Dragon, but no guarantee on that. Boot Sector Launch does what Rokkets need to do, get Rokkets on the field. Rokkets have some great Spell Cards and this is one of them. Art: 4/5 I think they made the gun look more like a laser.